2006 MSc in computer science. Saratov State Technical University, Saratov, Russia. 1993-1997 Doctoral student, Central Scientific Research Laboratory and Dept. of Normal Physiology, State Medical University, Saratov, Russia. Degree – Ph.D.
2009 to date: Associate Professor, Dept. Mathematics and IT, Academic University, St-Petersburg, Russia. 2008 to date Associate Professor, Head of laboratory of Bioinformatics, Saint-Petersburg University of Information Technology, Mechanics and Optics, Russia. 2008 Researcher The National Research Council, Institute of Clinical Physiology, Pisa, Italy. 2006-2008 Research fellow Project: “3D visualization of biological processes”. Scuola Normale Superiore, Pisa, Italy. 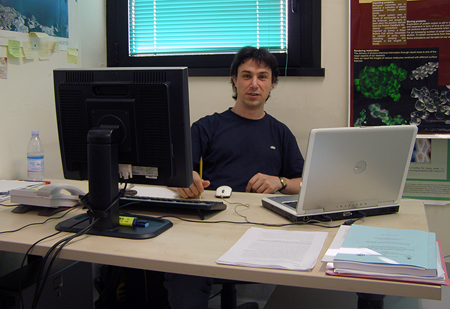 Laboratory of Molecular Biology (prof. Arturo Falaschi). 1997-2000 Assistant Professor Department of medical cybernetics and computer technique, Saratov State Medical University, Saratov, Russia. 1995-1997 Junior researcher Central Scientific Laboratory, Saratov State Medical University, Saratov, Russia. Porozov Yu.B. BioPython. Textbook for students of mathematical and informatics specialties (in progress). Scherbakov A. and Porozov Yu. Using wavelet-transform to detecting of origin of replication in human DNA. Mathematical Biology and Bioinformatics, V.6, 02, 2011. Krass A.L., Akishev I.R., Dakhin O.A., Gnilomedov I.I. and Nikolenko S.I., Porozov Yu.B., Stepanov E.O. Computation of optimal trajectory of transition between conformations of protein molecules based on transport theory. Proc. Of Conference “Integrated models, soft computing, probabilistic systems and program systems in artificial intelligent – IMMVII-2009”, 26-27 May, 2009, Kolomna, Russia. Vol.2, P. 156-170. Zoppé M., Porozov Yu., Andrei R., Cianchetta S., Zini M. F., Loni T., Caudai C., Callieri M. Using Blender for molecular animation and scientific representation. Proc. “Blender Conference 2008”, October 24-26, 2008, Amsterdam, 6 p.
Rishal I., Porozov Yu., Yakubovich D., Varon D., Dascal N. Gβγ-dependent and Gβγ-independent basal activity of G protein-activated K+ channels. J. Biol. Chem. 2005, 278 (6), 3840-3845. Ivanina, T., Varon, D., Peleg, S., Rishal, I., Porozov, Y., Dessauer, C.W., Keren-Raifman, T., Dascal, N. Gai1 and Gai3 differentially interact with, and regulate, the G protein-activated K+ channel. J. Biol. Chem., 2004, Vol. 279, Issue 17, 17260-17268. G. Brill, B. Porozov, Yu. Porozov, V. Dzulay and S. Gorodkov. Method of stydy of photoreactivity of isolated rat`s heart. Bulletin of experimental biology and medicine. 1998, Vol. 125, № 6, 717-720. Yu. Porozov, G. Brill and V. Kiritchuk. Influence of He-Ne laser radiation of pacemaker on the frog`s heart function. International Workshop “Nonlinear Dynamics and Structures in Biology and Medicine: Optical and Laser Technologies”, Proc. SPIE 3053, edited by Valery V. Tuchin, Saratov, Russia. 1996, 160-171. Yu. Porozov, G. Brill and V. Kiritchuk: Influence of He-Ne laser upon the development of hypodynamics depression in frog`s heart. In “Using low-power lasers and millimeter-waveband irradiation in experiment and clinic”, edited by Grigory Brill, Saratov, Russia, 1994, 85-87. G. Brill, Yu. Porozov and S. Khomiakov: An automated unit for studying the effect of discontinuous laser radiation on the isolated heart. Physiological Journal of USSR. 1993, Vol. 79, № 7, 118-122. Predicting DNA Replication Origins with Machine Learning Techniques M. Churakov, S. Nikolenko and Yu. Porozov. ISCB-ECCB 2011, Vienna, Austria. Modeling of Protein Conformational Movements Based on Principle of Average Action. A.Krass, S.Nikolenko, E.Stepanov and Yu. Porozov. ISCB-ECCB 2011, Vienna, Austria. Gorbinova A. and Porozov Yu. Structural modeling of BCR-ABL drug resistance mutations. Proc. Moscow Conference on Computational Molecular Biology (MCCMB`11). July 21-24, Moscow, 2011, p. 291-292. Porozov Yu., Andrei R. and Zoppè M. Visualization and modeling of protein motion. Autodesk Maya as a reliable and fast instrument for macromolecular dynamic representation. ISCB ECCB-09, Stockholm, 2009. Zoppè M., Porozov Yu., and Andrei R. Visualization of biological processes using 3D animation. Gordon Research Conference “Visualization in Science and Education”, July 1-6, 2007, Bryant University, Smithfield, RI. R. Andrei, Yu. Porozov and M. Zoppè. 3D visualization of biomolecules: representation of surface properties. ISMB ECCB, Vienna, July, 2007. Yu. Porozov, R. Andrei, M. Zoppè. Visualization of moving biomolecules: a new approach based on professional 3D animation software. NETTAB 2007, “A Semantic Web for Bioinformatics: Goals, Tools, Systems, Applications”, June 12-15, 2007, University of Pisa, Italy. Yu. Porozov, R. Andrei and M. Zoppè. Visualization and modelling of moving biomolecules: a new approach based on professional 3D animation software. ECCB-06, Eilat, January 2007. Rishal I. Porozov Yu. Varon D. Yakubovich D. & Dascal N. Gßg-dependent and Gßg-independent basal activity in GIRK ion channels. at the 2004 Biophysical Society Meeting, Baltimore. Rishal I., Porozov Yu., Varon D., Yakubovich D. & Dascal N. Basal activity of GIRK channels includes Gbg-dependent and Gbg-independent components. In Israel society of neuroscience, Annual meeting, Eilat 2003. Yu. Porozov, G. Brill, V. Kiritchuk: Modification of the cardiac activity in He-Ne laser irradiation of the pacemaker. In “Nonlinear Dynamics and Chaos. Applications in Physics, Biology and Medicine”, Saratov, Russia. 1996, 193-194. Yu. Porozov, G. Brill, V. Kiritchuk: Ghanges in photoreactivity of heart pacemaker in different phases of the cardiac cycle. In European Biomedical Optics Week “BIOS Europe `95”, Barcelona, Spain. 1995, 184. Yu. Porozov, G. Brill, V. Kiritchuk: Changes in heart reaction to pacemaker region irradiation by He-Ne laser in different phases of the cardiac cycle. In “Light and Biological Systems”, Wroclaw, Poland. 1995, 83. Yu. Porozov, G. Brill, V. Kiritchuk: Influence of low power laser radiation effect on time dynamics of hypodynamics depression development in amphibian heart. In “Clinical and experimental using of new laser technologies”, Moscow-Kazan, Russia. 1995, 340-341. Yu. Porozov, G. Brill, V. Kiritchuk: Influence of He-Ne laser irradiation on frogs heart. International Congress – Laser Medizin “Laser in Medicine and Surgery”, Munchen, Germany. 1995, Vol. 11,2, 108. Yu. Porozov, G. Brill, V. Kiritchuk: Influence of low power laser radiation on isolated amphibian heart. In 3th International Conference “Actual Questions of Laser Medicine and Surgical Endoscopy”, Moscow-Vidnoe, Russia. 1994, 464-466. Yu. Porozov, G. Brill and V. Kiritchuk: Influence of He-Ne laser upon the development of hypodynamics depression in frog`s heart. In “Using low-power lasers and millimeter-waverange irradiation in experiment and clinic”, edited by Grigory Brill, Saratov, Russia, 1994, 85-87. Yu. Porozov: Method of study of impulse laser radiation influence upon a heart. In “Laser and magnetic therapy in experimental and clinical studies”, Obninsk, Russia. 1993, 5-7. Courses “Introduction to bioinformatics”, “Introduction to protein biology”, “Web services for biological data analysis”, “Structural biology” – State University for Information Technology, Mechanics and Optics, St. Petersburg, Russia.